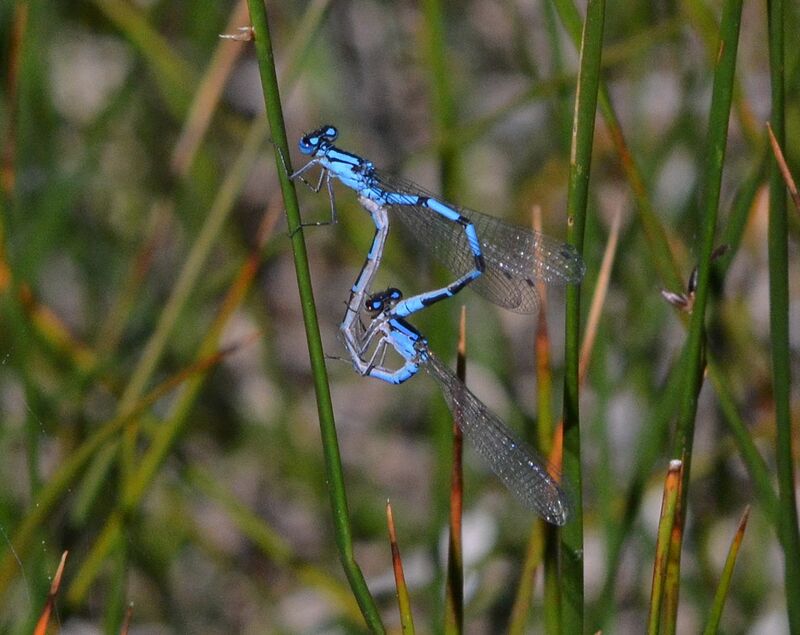 As I mentioned in the post on “Tandem Ovipositing” (07-09-14), damselfly reproduction consists of several distinct phases – territory establishment, mate recognition and acceptance, copulation and ovipositing. Once a male damselfly establishes and begins to defend a territory, he waits for a female that is ready to mate to fly into his territory. Mate selection involves the male clasping the female’s thorax with the four terminal appendages on his thorax. The male appendages connect with the thoracic plates of a female of the same species in a type of “lock and key” arrangement. The female rejects or accepts the male based on the size and shape of his terminal appendages. After acceptance, the male and female often spend time in contact with one another before actual sperm transfer. During this period the male may remove sperm deposited by previous couplings and prepare his own sperm. Following acceptance and a period in contact, the damselfly pair settle and perch for copulation. The female loops her abdomen forward and up to the male’s genitalia on his second abdominal segment. This is referred to as the wheel formation. Damselflies will often remain in the wheel formation for a long time before separating. This period in the wheel formation is thought to prevent a competitor from mating with the female, gives the male time to remove reserved sperm from a previous mating and generally provides the male’s sperm a better chance. Depending on the damselfly species, following copulation the female either oviposits alone or with the male in attendance. This northern bluet (Enallagma annexum) pair was photographed at Reflection Lake in Lassen Volcanic National Park (Lassen County CA). This entry was posted in Insects and tagged damselfly, Enallagma annexum, nature photography, northern bluet, tandem ovipositing, wheel formation. Bookmark the permalink.